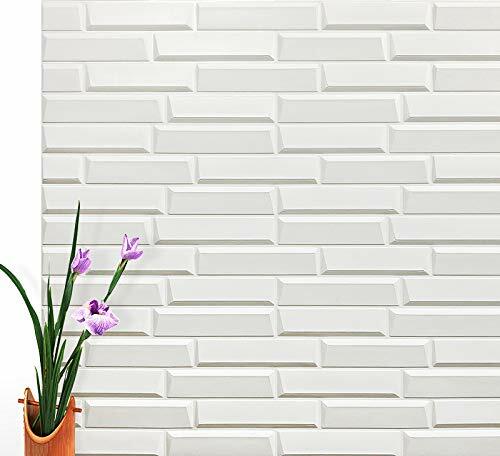 Easy DIY peel and stick tile white brick 3d wall panel is made of an self-adhesive substrate topped with a environmental PE-LLD material, the embossed 3d wall sticker offers stunning visual impact. the tiles are light, water proof, anti-collision, they can be installed in minutes over a clean and sleek surface without any mess or specialized tools, and never crack with time. Peel and stick 3d wallpaper is also an economic wall covering material, they will remain on your walls for as long as you wish them to be. The tiles can also be easily installed directly over existing panels or smooth surface. The tiles are resistant to the heat and the humidity of bathrooms (do not use in fire environment or shower). - Paste the surface clean with adhesion, such as: wood surface, glass surface, no dust wall, hit the bottom of the wall putty and so on. - Paste: the back cover torn paper pasted to the auxiliary tools: scissors, utility knife. Recommended use: Featured walls, TV walls, sofa background , living room walls, bedroom walls, home office wall decoration etc, DO NOT use in shower.